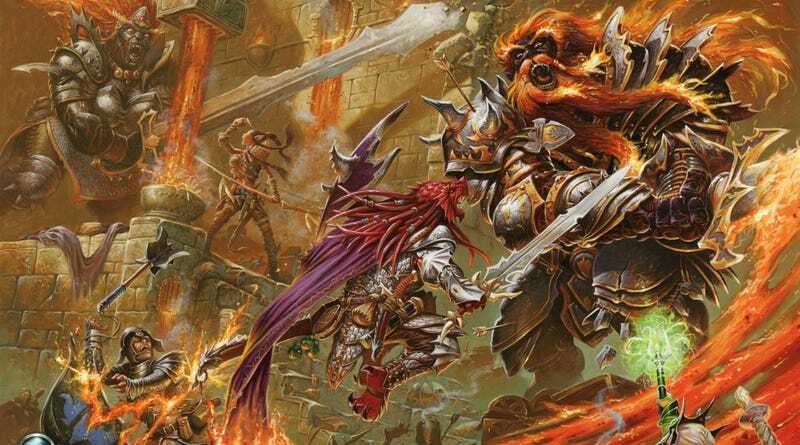 With the next edition of Dungeons & Dragons finally ready for release later this year, you may be thinking it's time to garage sale all those 4th Edition books on your shelf. Here's a better idea – use them for player-versus-player wizard battles. 4E has a pretty bad rep: too focused on combat, too rigid, uncompromising grid system, emphasis on class and level balance makes it too predictable, and so on. And it's true, as an RPG, 4E felt like a straight-jacket for even the most imaginative groups. Player-versus-player turns all those weaknesses around and makes them strengths. A rigid, codified combat system constrained by a grid is the ideal rules set for pitting one party of adventurers against another. With all the classes balanced so that everyone has an equal amount of combat options, 4E is infinitely better for PVP than any other edition of D&D. If you look at it as a squad-level combat game with a huge amount of customizability and very flexible tactics, you'll see 4E in a new light. If the idea of competing teams of wizards, warriors, thieves and clerics going head to head sounds as awesome to you as it does to me, here are a few tips to get the PVP action rolling. Don't battle one-on-one. There are some classes that just don't match up. A striker like a barbarian is going to obliterate a controller like the wizard. You want team versus team so the players can work together, use different strategies, and have character abilities complement each other. If you're running this at your local game store, you could put together 5-player teams, but if it's just your gaming group, 3-on-3 will work. Don't do deathmatches. I'm not saying deathmatches are terrible – Fourthcore Team Deathmatch has been running these kinds of tournaments at cons for years – but I find toe-to-toe slugfests strategically unsatisfying. [To be clear, I think Fourthcore Team Deathmatch is awesome, I just prefer a slightly different style.] Instead, place three victory zones on the battlefield, each 2 squares by 2 squares. Teams score victory points at the start of their turns for each zone they control (by being the only team to have a character in a given zone). Give each battle a time limit, with each team getting one more turn after time expires, and the team with the most victory points wins. This makes 4E's leaders and controllers much more interesting and useful, since they can lock down an opponent making a run for a victory zone or nudge an ally into the proper position to gain some points. Allow respawns. Some characters are squishy, some players have bad luck. No one wants to sit and watch for half an hour because their cleric took a critical hit from a ranger on turn two. Just make sure the respawn point is far from the victory zones, and give respawned characters the "dazed: save ends" condition so there's some drawback to dying. Make the environment interesting. Don't just drop all the characters into an empty fighting pit. Put a lava river with a stone bridge in the middle. Surround one of the victory zones with traps for the rogue to disable. Put another on an elevated area only accessible by rope net. Water to swim through, difficult terrain to slow people down, pillars to hide behind, even doors to lock and corridors to chase through, all force the players to make choices and be use creative tactics. You can even seed the arena with monsters that follow simple rules like, "Move toward and attack the nearest character." Just be very clear ahead of time which squares provide cover, which are blocking terrain, and so forth. If you're going to play competitively, you need these things to be codified. Daily powers are a little tricky. A lot of the tension and strategy in 4E comes from use and recovery of limited resources, but in a PVP battle, the players aren't going to go rest and recover their powers. If you're playing with your friends and you have the time, you could play a "best two out of three" battle, with each round's time limit set for 50 minutes. Daily powers can only be used once throughout the entire contest. Or you could just give everyone all their powers to use in every battle. In that case, it becomes a matter of setting up the perfect situation to unleash your big daily power. Use a rigid character creation system. You can have some pregenerated characters handy for walk-ups if you're playing this at a game store of con, but a lot of the fun comes from designing a character yourself and pitting it against your friends. The characters need to be on even footing, so use a point-buy system for basic stats and a set amount of gold to spend on gear and magic items. Obviously, every character should be built at the same level – I suggest 5th, because it gives everyone some juicy character building options and a variety of powers, but not so many that the game bogs down. Most of all, have fun with it. Although it's a competitive format, the key to PVP 4E is to get everyone excited about the big attack rolls and end each battle with a lot of cheering and back slapping. Experiment with your group to see what format works best – we've tried a "capture the flag" scenario with a DM running things, or you might you like a straight up deathmatch more than my victory zone idea. You could even play with more than two teams if you have enough players and a large enough table – just make sure you use one more victory zone than the number of players.